How can we harness the future if the past will not set us free? An emotive story of love, loss and letting go. Opposites attract? Laura Brown, interior designer and James Morgan-Jones, horse whisperer – and Midnight Sky, a beautiful but damaged steeplechaser. Laura seems to have it all, glamorous job, charming boyfriend. Her sister, Maggie, struggles with money, difficult children and an unresponsive husband. She envies her sister’s life, but are things as idyllic as they seem? She might be a farmer’s daughter but Laura is doing her best to deny her roots, even deny her true feelings. Until she meets James, but James is very married, and very much in love, to a wife who died two years ago. They both have issues to face from their past, but will it bring them together, or push them apart? Many thanks to Jan Ruth for sending me an e-copy as part of Rosie Amber’s book review team. James is a widower and, in the two years since his wife’s sudden death, has built an impenetrable wall around himself and is in a very dark place emotionally. He runs an equestrian centre with his sister, Liz, and finds it hard to anything much else other bury himself in work until he, literally, drops with fatigue. Laura and her lover, Simon, run a property development and interior design company and are working and living together. Laura and Simon had an affair while Simon was still married, and his bitter and resentful wife seems to be permanently in the picture. Consequently things are not going too well and when Laura suffers a harrowing trauma her relationship goes from bad to worse. Maggie, Laura’s sister, is having seemingly insurmountable problems of her own, money worries, her insensitive husband and her pretty but offensive teenage daughter. Her younger daughter, Ellie, has mild autism which is helped by her riding lessons with James, but Maggie doesn’t know how much longer she’ll be able to afford them. On top of all that she’s waging a losing battle with her weight. Laura scrambled to her feet. “Hi,” she said, offering her hand. It seemed an age before he accepted. It was a reassuringly firm grip, but he couldn’t have cared less who she was or what she had to say. He had very dark, green eyes, like seaweed or olives. They were sad eyes, she remembered thinking later. All the involved story threads are woven together beautifully and, one way or another, the colourful array of characters manage to bring out the best qualities in each other. Midnight Sky encompasses such a lot, emotional highs and lows, relationships, heartache and not to mention a good dose of teenage angst. The story is set mainly in Snowdonia, which is described in evocative detail, giving a vivid sense of place. Jan Ruth’s writing flows easily and the story is captivating and poignant. The complete mixture of emotions are conveyed with such realism and sensitivity I couldn’t help but empathise. James, suffering so much torment and yet so patient and gentle with his horses, especially the damaged, untrusting Midnight Sky, and the children he takes for specialist teaching. He is a complicated and compelling man. Laura and Maggie are both facing critical and life changing situations and learning how to deal with them. All the characters are genuine and credible and penned sympathetically. I was drawn completely into their lives almost without realising it. Very nearly a fly on the wall. I loved it! 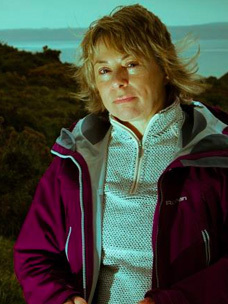 Jan Ruth was born in Bowden, Cheshire, and moved to North Wales in 1998, although she has always maintained a strong connection with the area from a much earlier age. Her feel for the Welsh landscape is evident in all of her books. Jan started writing at primary school, winning prizes for poetry and short stories. Her first novel attracted a London agent, but failed to find the right niche with a publisher because it didn’t fall into a specific category-not quite light enough for romance but not literary fiction either, sitting somewhere between these two genres. Her second novel, again snapped up by a London agent; suffered the same fate. Undeterred, Jan has continued to write, believing her market is out there. Jan writes contemporary women’s fiction. Love stories with strong, identifiable characters, about family life and relationships. Really great book from Jan, I too loved all the characters and just wanted to help James pull out of his depression anyway I could. I know! He was really the character that drew me in the most. This looks like a really great story. I am definitely going to read this one.